The UK really does know how to put on a good food festival. It may not be sunny all of the time, but the atmosphere and buzz at these food festivals is something not to be missed. Food festivals in the UK are getting bigger and bigger each year. As the British are notorious for both their love of 5 star casino games and food, new festivals are popping up all of the time. There’s a food festival for everyone; cheese festivals, vegan festivals, and even garlic festivals. If you’re heading to the UK and want to sample some of the best foods we have to offer, check out these top food festivals. The Foodies Festival is the biggest food and drink festival in the UK, touring around major cities over the summer including London, Edinburgh and Birmingham. 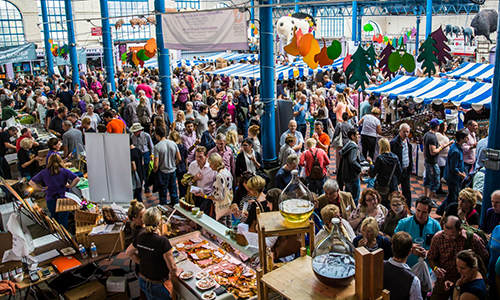 With over 50 food and drink stalls, you’re bound to found something you enjoy. You’ll get to sample tasty dishes from pop up restaurants and devour lots of delicious street food. There’s also a chance for you to learn new recipes from the many masterclasses performed by celebrity chefs. It’s a fun festival for the whole family; there’s live music being played all day long, bouncy castles and entertainment for the kids and even champagne, wine and beer masterclasses for the adults. As the name of this festival suggests, the garlic festival on the Isle of Wight celebrates all things garlic. Here you can buy locally grown garlic and try many delicious garlic infused foods. There are some weird garlic fusions, but these sound fun to try. In the past, they’ve had garlic infused popcorn, garlic fudge and garlic ice-cream. As well as having ample of garlic produce, the garlic festival also has a range of meats, cheese and cider. There’s also a variety of music acts, cooking demonstrations and a funfair. The Big Feastival was created by the world famous chef Jamie Oliver and Blur bassist Alex James. This festival is set in The Cotswolds, a picturesque countryside location and is hosted over 3 days. Enjoy good food and music while hopefully soaking up the glorious sunshine. There’s plenty to do there from eating (of course), attending cookery classes and watching cooking demos. What’s different about The Big Feastival is that you can camp there for the whole weekend, meaning you can eat and drink to your heart’s content without worrying about the drive home. When you go back to your tent, it’s the perfect opportunity to get on your phone and play a few slots at Dreamjackpot. For the vegans and veggies out there, the VegFest is the one for you. The VegFest is situated across various UK locations including Bristol, Brighton, Glasgow and London. VegFest is considered to be one of the biggest and best vegan festivals in Europe. All of the food is vegan friendly and you can sample tasty dishes from multiple vendors from local cafes and producers. You can also enjoy a range of live cookery demos to learn more about veganism, listen to talks on health and nutrition, and dance the night away to live music.